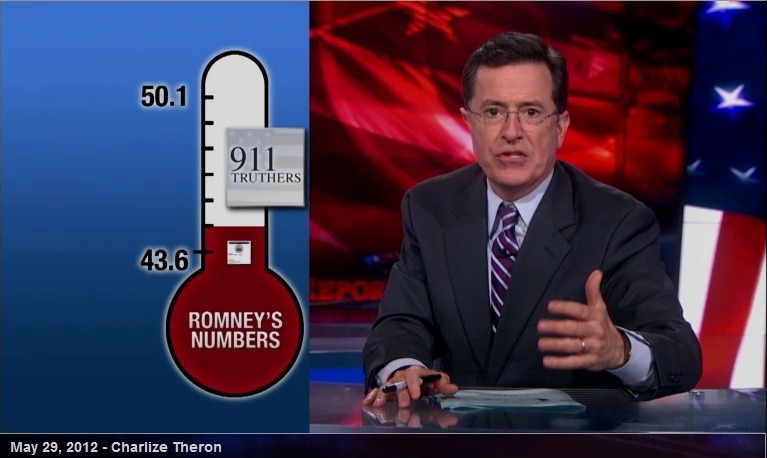 Steven Colbert calls 9/11 Truth "miniscule"
On the May 29, 2012 episode of the Steven Colbert show, Steven Colbert likens 9/11 Truthers to "alien abductees", "doomsday preppers" and "sasquatch hunters", while compiling a comedy-list of groups to get Mitt Romney from 43.6% to 50.1% of the US popular vote. This seems like an acerbic likening. According to Sienna polling data from May of 2011, 48% of New Yorkers support a new investigation into the collapse of World Trade building 7. That would be just about half the audience. After having taken a break for a couple of weeks, both the Daily Show and the Colbert Report have returned to the air. Colbert continued right after his Romney sketch with a routine on "Arab Groundhog day", giving a typical American depiction of the people of the region with a groundhog wielding a rocket launcher. Is this equally as acerbic (as above), when considering that US ambassador Susan Rice and Secretary of State Hillary Clinton appear to be claiming responsibility for the latest deaths in Syria by way of NATO-led terrorists operating in Syria? You decide. Who will stand up for DePue in battle against Exxon-Mobil, CBS-Viacom? Trying to learn how to use google's related search tool, I got an ineresting list of media-oil companies.... ????? I don't get it yet. Markgm on Thu, 05/31/2012 - 4:03pm. Thanks for posting this Mark -- I saw this episode too. Page right out of Jonathan Kay's book to smear 9/11 truthers by association. I sent the Colbert Report an email, but little good it will do. A couple of years ago their forum was literally dominated by truth activists who won the day, and yet they pretend they don't know the score. Many of us chipped in for the 3rd round of TV ads expecting them to air. As it stands, the money is just sitting there. The effect of TV advertising is cumulative, so an $85,369 buy can still be very effective and possibly spark a chain reaction. RL McGee on Thu, 05/31/2012 - 6:46pm. RL McGee you're letting them off way too easy when you say this show's producers "pretend like they don't know the score". They are acting like they DO know the score and they're saying they know 911 Truth is not to be taken seriously. That's their very obvious message. But why now? Are they worried about the tipping point actually starting to pivot? My freinds love this guy, I used to think he was clever and even subversive but no more. He's as naked to me as the emperor himself. chriskin on Thu, 05/31/2012 - 8:08pm. I don't get redirected to their fundraising effort. I wish someone would video record the commercials actually airing so we can verify it occurred when it is supposed to. I'm disappointed in that effort. But its hard when you can't raise money for 9/11 Truth, and that seems to be the case all over. From 911Truth.org to HistoryCommons to Luke Rudkowski etc. Orangutan. on Thu, 05/31/2012 - 8:19pm. I also just saw the may 31 shows. I won't be watching these guys again. I won't be praying for any little rays of light sneaking through there anymore. TDS did a segment saying, "Assad has killed 10,000 Syrians and that the Russians are stopping us from helping them". There are so many "game over" bits going on in current affairs now. I did manage to turn a few heads with comments at the show pages, though. At least half the audience for these shows, imho, are as dumb as a box of rocks. These shows removed their discussion forums. Before that happened, they deleted everything I had posted there over the years, saying somebody did some hacking there or something. So they must be corralling the dumb audiences for these shows and sealing the lid. I agree wholeheartedly with your idea regarding Remember Building 7, and I will write them saying so. The $85K after all that time seems a pretty clear indicator that it isn't really moving. (Hey, look at me. I need a job and I am getting ready to live in my car). The money could be used in New York, perhaps, to put them up to around some critical mass? In any event, we're coming to a point where they may not be able to buy any ads in the US at all. Maybe reading and writing are no longer appropriate anyways, but perhaps in-person, where monkey-see monkey-do can see and do that, eh? I do enjoy bumping into people in public places and sharing this-and-that. I'm beginning to wonder if simply working with information in a seated position is somehow just not capable of breaking any American spells. ??? Courage-see, courage-do. ??? The Ron Paul movement, for example, in reality, seems quite big. He wants another investigation. Colbert and Stewart also said Romney won the primaries, and Colbert had a quick shot of Paul as an angry man. Boy, do I digress.... Thanks to you, Mr. McGee, for everything you have done. Markgm on Thu, 05/31/2012 - 11:35pm.